According to my taste, boiled or steamed cauliflower is so blaaah. I recently taught this cauliflower tart in one of my classes. Since the pastry is made with oil, its texture and flavors are very light. For the filling, the cauliflower is combined with fresh mint leaves, eggs, cheese, salt, cinnamon and more. I’ll bet you didn’t think you could make cauliflower taste so exciting, right? Surprise! 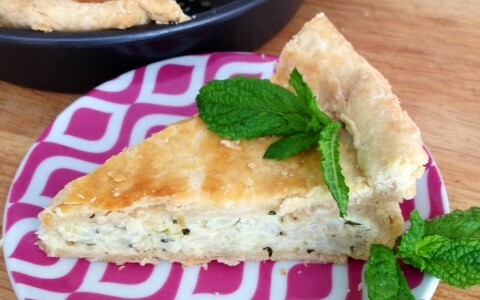 Serve the tart warm or at room temperature alongside a green salad or other vegetarian selections. 1. Measure the flour and salt into a 3-quart mixing bowl. 2. Add the oil; mix with a pastry cutter or a fork until particles are size of small peas. 3. Sprinkle in the water, 1 tablespoon at a time, mixing until flour is moistened and dough almost cleans side of bowl. 4. If dough seems dry, 1 to 2 tablespoons oil or water can be added. 5. Gather dough together until it amalgamates. 6. Divide the dough into two balls. 7. Wrap each ball in plastic wrap; place dough balls in freezer for 10 minutes. 1. Working on a cutting board, chop the cauliflower florets (not too coarse and not too fine) to measure 3 cups. 2. Transfer the 3 cups chopped cauliflower to a mixing bowl; set aside. 3. In the meantime, finely chop the mint leaves; add them to the chopped cauliflower in bowl. Cover and set aside. AT THIS POINT, DO NOT ADD THE OTHER INGREDIENTS TO THE CAULIFLOWER UNTIL AFTER BOTH PASTRY SHEETS HAVE BEEN ROLLED OUT. 1. Lightly flour one waxed paper sheet measuring approximately 16 inches long. 2. Take one dough ball from refrigerator and discard the plastic wrap. 3. Working on the floured waxed paper sheet, flatten the dough ball to a disc measuring 6 inches. If the edges crack, try to piece them together with your fingers to form a smooth circle (as best you can). 4. Lightly flour the top of dough disc. 5. Measure another waxed paper sheet – to 16 inches long. 6. Place the second waxed paper sheet over the dough disc. 7. Using a rolling pin, roll pastry 2 inches larger than the inverted pie pan. 8. Peel off the top paper. 9. Place one hand underneath the bottom waxed paper sheet and another hand over the rolled-out pastry. 10. Quickly invert pastry into pie pan. 11. Carefully remove the second waxed paper sheet. 12. Adjust the pastry to fit in pan (there will be a 2-inch overhang). 13. Using a fork, make a few scattered holes in bottom of pastry sheet. 14. Roll out the second pastry, following above instructions. 15. Peel off the top paper and set the pastry aside while you finish preparing the cauliflower filling. 1. Using a fork, stir the cheese, eggs, salt, black pepper, sugar and cinnamon into the cauliflower and mint mixture. 2. Gently mix the ingredients until they are uniform. 3. Using a spoon, transfer the filling to the pastry-lined pie plate. 4. Quickly invert the second pastry and place it over filling. 5. Peel off the waxed paper and discard it. 6. Meanwhile, using a knife, trim the pastry edges to one-inch. 7. Roll or curl the pastry edges in a downward motion so that they are tucked into the plate’s edge. 8. Slightly pinch pastry edges to create fluted edges. 9. Using a fork, make scattered holes in pastry (this will avoid ballooning while baking). 10. Cut 3 foil paper strips that measure 2 inches wide. 11. Cover the pastry edges with foil strips. 12. In the meantime, in a small bowl, make egg wash: mix together 1 egg yolk with 1 teaspoon cold water with a fork. 13. Using a pastry brush, brush the pie top with egg wash.
14. Place the tart on a rack set in center of oven. 15. Bake the tart for 30 minutes. After 30 minutes, remove foil strips. 16. After removing foil strips, bake the tart for an additional 5 minutes. 17. Transfer tart to a counter to cool. 18. Serve the tart warm or at room temperature. Shopping for fresh fruit and vegetables at Farmers’ Markets brings me back to my days in Italy. As I accompanied my grandmother or “Nonna Annunziata“, the maestra advised me on how to choose the best ingredients for our meals. Right now, it’s time for easy, no-fuss summer meals. The simplest side or vegetable that works for me is roasted potatoes. This classic recipe made with rosemary and garlic pairs well with any grilled meat, poultry or fish. Add a green salad dressed with extra virgin olive oil and vinegar. Buon appetito! 2. Meanwhile, wash and dry the potatoes. 3. Place potatoes in a 12X16 rectangular baking dish. 4. Add the olive oil, garlic, rosemary leaves, salt and ground black pepper to the potatoes. 5. Using your hands, toss all ingredients together until the potatoes are evenly coated. 6. Place the baking dish with potatoes on an oven rack set in center of preheated oven. 7. Roast the potatoes for 25 minutes. 8. After 25 minutes, toss the potatoes. 9. Roast the potatoes for an additional 10 to 15 minutes or until they are tender. 10. To test doneness of potatoes, insert a fork into one of them. If the potato is tender, it is done. 11. Serve Roasted Summer Potatoes immediately. How many of you love lentils? FYI, lentils been around for about 13,000 years and are an important staple o the Mediterranean diet. 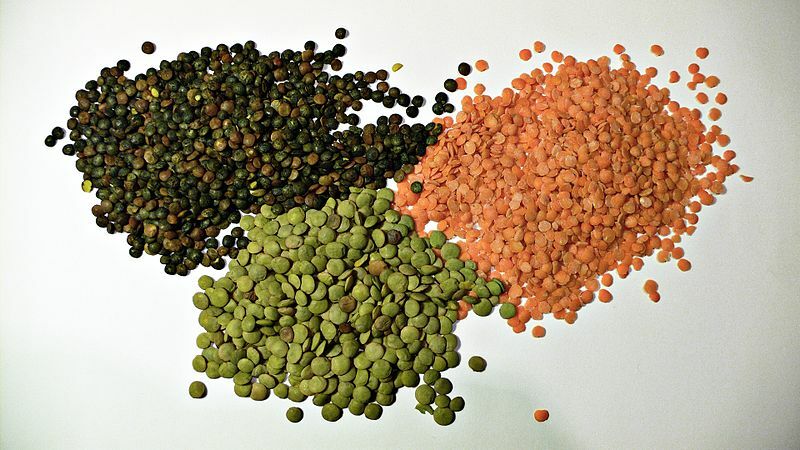 You can find different varieties of lentils that range in color – orange, brown, black, yellow and green. 1. Cut tomatoes in half; discard seeds and pulp. 2. Chop tomato flesh into ¼-inch pieces; set them aside in a small bowl. 3. Finely chop the onion; set it aside in a separate bowl. 4. Peel the garlic cloves and split them open; remove & discard the hearts. 5. Using a garlic crusher, crush the garlic over the chopped onion in bowl; set aside. 6. In a 12-inch skillet, heat 3 to 4 tablespoons of the olive oil (do not let it smoke). 7. Using a wood spoon, stir in the chopped onions and garlic mixture. 8. Stir fry the onion-garlic mixture over medium-high heat for 2 minutes or until onions are translucent. 9. Add the chopped tomatoes and cook for 1 to 2 minutes, stirring occasionally. 10. Meanwhile, drain the soaked lentils in a colander; add them to the tomato mixture in skillet. 11. Cover the lentil mixture with cold water. 12. Bring the lentil mixture to a boil and cook it for 15 to 20 minutes on medium heat (it should simmer-boil). Stir occasionally. 13. After 15 minutes, stir in the salt and pepper; taste the lentils. If lentils are a little raw, cook them for an additional 5 minutes. 14. After 5 minutes, taste the lentils and adjust seasonings. They should be cooked. If not, cook lentils 2 to 4 minutes longer. 15. Transfer the cooked lentil mixture to a colander set over a bowl. 16. Let the lentils drain and cool for about 30 minutes. 17. After 30 minutes, transfer the lentil salad to a porcelain or glass bowl; stir in the chopped parsley. Taste and, if preferred, add a little more olive oil. 18. 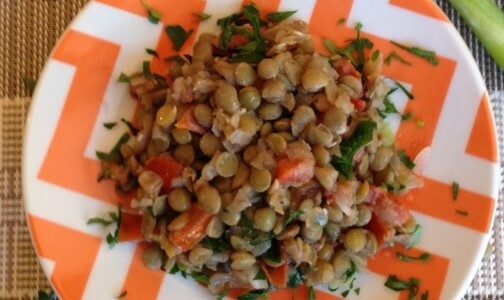 Serve this lentil salad as a side dish to chicken, meat or fish. Alternatively, it can be served alongside other vegetables. 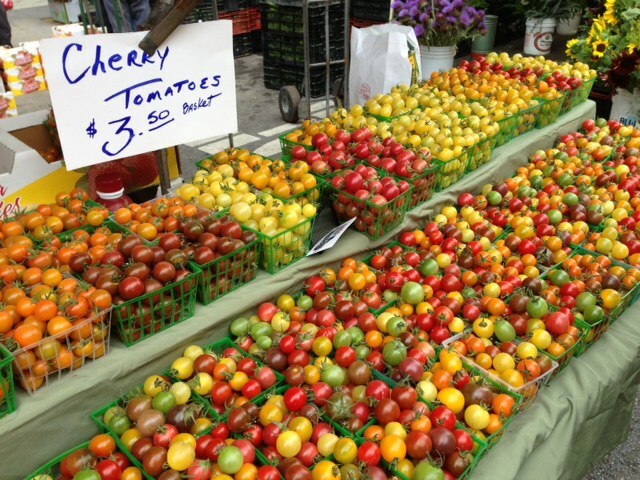 In the last two weeks, as I’ve gone up and down the stalls at the Santa Monica Farmers’ Market, it’s been difficult to ignore the bright, multicolored cherry tomatoes. Don’t they look spectacular? In response to one of our Facebook friends, here’s a recipe for tomatoes and basil (btw, we’re using cherry tomatoes here). 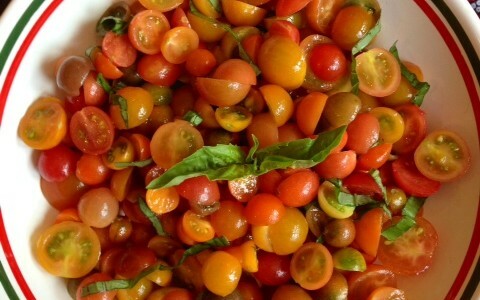 Simply, cut the cherry tomatoes in half, add salt, pepper, extra virgin olive oil and basil. Get some good European-style bread and eat your heart out! Now, who says you have to cook to eat well? 1. Remove stem from each cherry tomato. Cut each tomato in half; set halved tomatoes in a serving bowl. 2. Add salt and pepper, to taste. 3. Using two spoons, gently stir in 2 tablespoons extra virgin olive oil. Toss and taste. 4. If needed, add a little more olive oil, one tablespoon at a time. Taste the tomatoes with each olive oil addition. 5. Using kitchen shears, cut the basil leaves into slivers; toss the basil slivers into the tomato salad. Serve Cherry Tomatoes & Basil with fresh, crusty bread. Today, I bought fresh broccolini at a local farmers’ market. After cooking it for a few minutes, I decided to add it to some fusilli (Italian for “corkscrew pasta”). With a little extra virgin olive oil, salt and pepper, it turned out to be quite good – especially with Hot Calabrese Pepper Preserves (previously published on this website on October 18). This pasta dish is simple but good – enjoy. 1. Transfer the drained and cooled broccolini to a large serving bowl. 2. Stir in some extra virgin olive oil (about 1/4 cup), salt and pepper, to taste. Set aside. 3. Meanwhile, bring a 4-quart sauce pot filled with water to a boil. 4. Add the fusilli or other short pasta variety to the boiling water, 1 teaspoon salt and stir. 5. Cook, uncovered (medium-high heat), stirring occasionally, for 8 to 10 minutes, until pasta is al dente or crunchy-tender. Different types of pasta will vary in cooking times). 6. 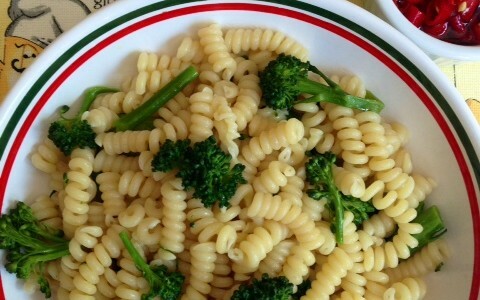 When pasta is cooked, drain and add it to the serving bowl with broccolini. 7. Toss the pasta and broccolini. Taste and adjust seasonings, including the olive oil level. 9. Ask guests to add some Hot Calabrese Pepper Preserves and/or some grated Parmigiano Reggiano or Pecorino Romano cheese to their individual pasta bowls.